Orange Sunrise Rotarian Rae Shirer was named Rotarian of the Year by Governor Bret Gerdes at the Governor’s Transition Dinner on June 8, 2010. 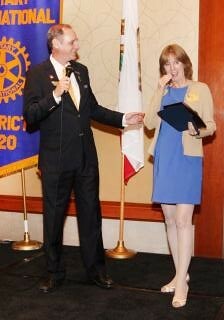 Rae was surprised to receive the plaque for her work as District Secretary and Club President during the 2009-10 Rotary year. This entry was posted in Member News on June 8, 2010 by Rae.